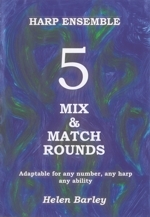 These rounds can be used in many different ways, depending on the ability and number of the players and the imagination of the leader or teacher. Feel free to arrange them how you like. More adventurous players may like to improvise over the top, once the round is in progress. All players must start with an ostinato bass line or the first tune. Players go through the piece together, line by line. Each player goes as far as they are able, then goes back to the beginning or repeats their favourite line, until they hear the “End Signal Bars”. The piece will grow in texture as the combination of lines changes, but all parts will fit together. These can be used in many different ways, depending on the ability and number of the players and the imagination of the leader or teacher. Feel free to arrange them how you like. More adventurous players may like to improvise over the top, once the round is in progress. All players must start with an ostinato bass line or the first tune. Players go through the piece together, line by line. Each player goes as far as they are able, then goes back to the beginning or repeats their favourite line, until they hear the “End Signal Bars”. The piece will grow in texture as the combination of lines changes, but all parts will fit together. Quite often, one part can be played with 2 hands or by 2 people, to make them easier. More able players may play one of the simple bass lines throughout, from memory, while playing through the melodies with the right hand. 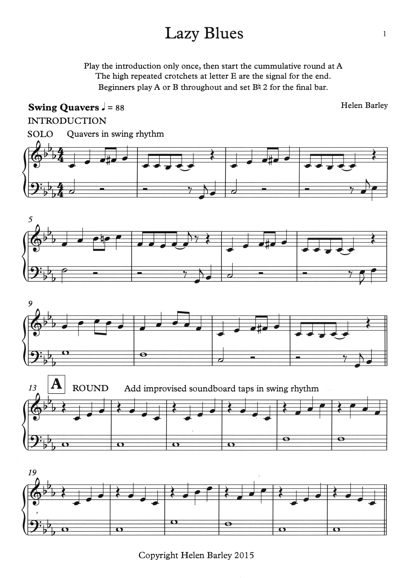 If no-one is able to continue with the bass line and melodies together, then one or more players will need to play the bass line throughout the piece, maybe taking it in turns. Alternatively, the pieces may be played as a conventional 3 or 4 part round. One or two more able players will signal the end by playing the final “Signal” bars, which all players must learn to recognise, and know to finish all the end of their current line. Bowing. A bass line may be played using a half size violin bow, but it needs one player for each note. Players may play “their” bass note with a bow in the left hand, while playing through the melodies with the right.